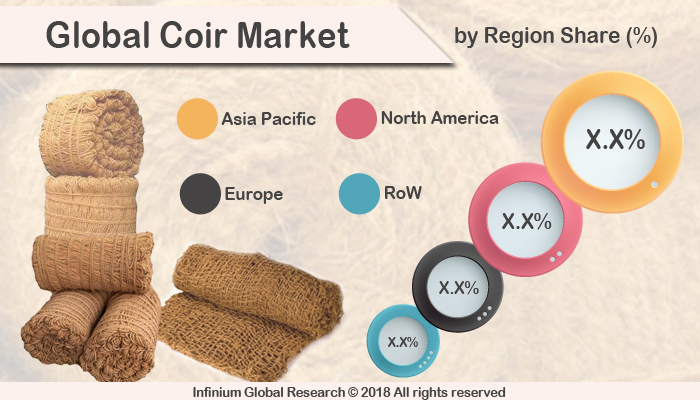 A recent report published by Infinium Global Research on coir market provides in-depth analysis of segments and sub-segments in global as well as regional coir market. The study also highlights the impact of drivers, restraints and macro indicators on the global and regional coir market over the short term as well as long term. The report is a comprehensive presentation of trends, forecast and dollar values of global coir market. According to the report, the global coir market is projected to grow at a stable CAGR over the forecast period of 2018-2024. Coir is a fiber from the outer husk of the coconut, used in potting compost and for making ropes and matting. Among vegetable fibers, coir has one of the highest concentrations of lignin, making it stronger but less flexible than cotton and unsuitable for dyeing. Coir is widely used in the upholstery industry, and it is a healthy substitute for processed synthetic rubber. It is also used as a combination with natural rubber for filling up mattresses, automobile seats, sofas, settees, and seating systems. Moreover, Coir is used for insulation and it also finds application in panels, cold storages, and food industry. A coconut harvest occurs once in 45 days. From 1000 coconuts it would be possible to extract 10 kgs of coir. Growing demand for eco-friendly products and lightweight properties of coir drives the growth of the global coir market. As it is a material that occurs in nature it is completely renewable and is therefore considered an excellent choice for environmental sustainability. Growth in the end-user industries and the number of by-products obtained from coir are boosting the growth of the coir market. However, the use of other natural fibers and synthetics are likely to restrain the growth of the coir market. Furthermore, Coir ply has all the properties of phenol-bonded ply with the added strength of fiber reinforced phenol bonding. This in turn is creating several growth opportunities for the key players in the coir market. The government is encouraging private investments in its handloom and coir industries to enhance productivity and maintain the competitive edge. The policy also proposes to introduce power looms to promote state-of-the-art units of international standards. Among the geographies, the Asia Pacific region is leading the coir market due to the highest production in India and Srilanka. APAC region is followed by North America and Europe. India has made considerable efforts to promote coir industry including establishing an annual International Coir Festival. The efforts support the market expansion for coir and India hopes to further increase production by streamlining the fibre collection process to meet demand. Mainly the coastal region of India, produces around 60% of the total world supply of white coir fiber, whereas Sri Lanka produces around 36% of the total world brown fiber output. On the other hand, Coconuts are grown in more than 93 countries in the world and therefore there is considerable scope to develop coir industry in further countries. The report on global coir market covers segments such as processing, products, and applications. On the basis of processing the global coir market is categorized into the brown fibre, white fibre, buffering and bristle coir. On the basis of products, the global coir market is categorized into coir fibre, coir pith, coir yarn, curled coir, and coir ply boards. On the basis of applications, the global coir market is categorized into upholstery-mattresses, insulation, erosion control, agriculture, netting, and matting. The report provides profiles of the companies in the global coir market such as Geewin Exim., SMS Exporters, Sai Cocopeat Export Private Limited, Kumaran Coir, Allwin Coir, Travancore Cocotuft Pvt. Ltd, BENLION COIR INDUSTRIES. and Classic Coir. The report provides deep insights on demand forecasts, market trends, and micro and macro indicators. In addition, this report provides insights into the factors that are driving and restraining the global coir market. Moreover, IGR-Growth Matrix analysis given in the report brings insight into the investment areas that existing or new market players can consider. The report provides insights into the market using analytical tools such as Porter's five forces analysis and DRO analysis of coir market. Moreover, the study highlights current market trends and provides forecast from 2018-2024. We also have highlighted future trends in the coir market that will impact the demand during the forecast period. Moreover, the competitive analysis given in each regional market brings insight into the market share of the leading players. This report will help manufacturers, suppliers, and distributors of the coir market to understand the present and future trends in this market and formulate their strategies accordingly.